There are a bunch of reasons to love the Grumman Tiger. I read hundreds of magazine articles and aircraft reviews about all kinds of airplanes before settling on the Tiger. 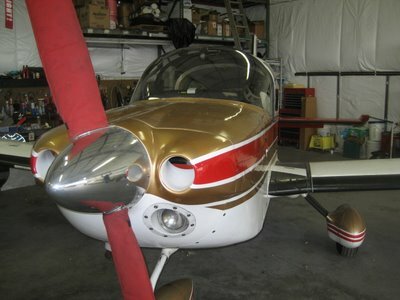 If you're interested, here are the articles about the Tiger that helped me decide on what kind of airplane to get. WE GOT A PLANE WE GOT A PLANE CAN YOU BELIEVE IT WE GOT A PLANE OUR VERY OWN PLANE A TRUE REAL AIRPLANE THAT I CAN FLY AND FLY AND ITS AN AIRPLANE AND WE HAVE IT WE GOT IT AN AIRPLANE OH MY GOODNESS GREGORY WE GOT AN AIRPLANE A TIGER ITS AN AIRPLANE A REAL LIVE AIRPLANE THAT WE CAN FLY I CAN FLY IT MYSELF WHENEVER I WANT BECAUSE ITS OUR AIRPLANE AND I CAN FLY IT! Returning to my usual, dignified self -- we just closed a deal on an airplane. We decided about a month ago to buy one, and decided on a Grumman Tiger for a whole bunch of reasons that I'll explain in another post. Suffice it to say, for now, that the Tiger is fast, handles well, has a great useful load with a wide center of gravity envelope, is fuel efficient, and is a neat airplane in a lot of little ways, such as the fighter-like sliding canopy. I have shopped all over. I came close to buying one in Arizona, but the seller ( a large aircraft broker) was clearly not being forthcoming about the plane. I went to see one on Long Island, and I saw one in Lapeer, Michigan. Then this one turned up at the airport where I grew up in Maine, only six miles from my parents' house. I talked to the seller for quite a while, had a mechanic inspect it, and otherwise learned everything I could about it. It is a 1979 Gulfstream American Corp. AA-5B Tiger. 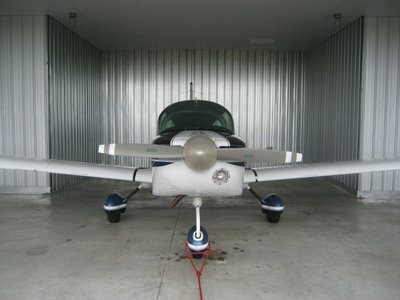 It has a Lycoming O-360, four-cylinder engine that puts out 180 horsepower. The engine has about 525 hours since its last major overhaul, and the maintenance records are meticulous. It has fixed (non-retractable) gear and a fixed-pitch propeller. It has seats for four people and has a baggage compartment behind the rear seats. The seats. 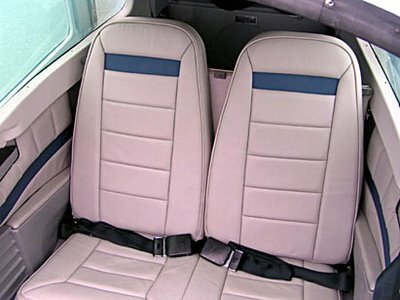 The seats on our Tiger are newly done in beautiful leather. 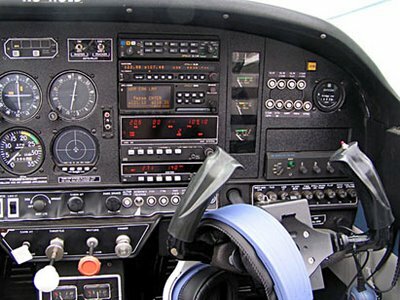 The instrument panel has one of everything I could ask for, including approach-certified, moving map GPS, autopilot, strikefinder, and audio inputs for my iPod. The only thing I could possible ask would be for newer equipment, but that newer equipment couldn't give me much more capability. 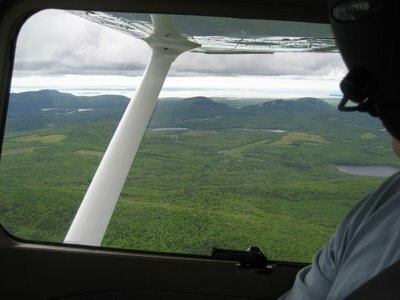 I flew by airliner to Maine on Saturday to inspect the airplane myself and possibly seal the deal. The seller wasn't available on Saturday evening, so I had a nice dinner with my dad, spent some time with my parents, and then visited with my brother, sister-in-law, and two nephews. The younger of the two, Owen, is putting heart and soul into learning to crawl. 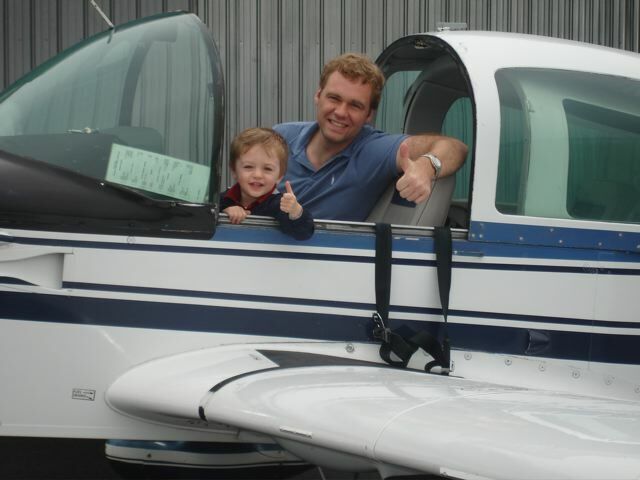 The older boy, Emerson, was in high speed cogitation over going to see the airplane, crazy legs and all. So we all went to see it on Sunday morning. And it is pretty much everything I could ask for in a plane. The paint is original, but in good condition. It could use a paint job someday, but it's in better condition that many of the planes I've been flying. Perhaps best of all, Emerson seemed to heartily approve. The seller is going to deliver it, perhaps tomorrow. And I am neither sleeping nor accomplishing anything at work. 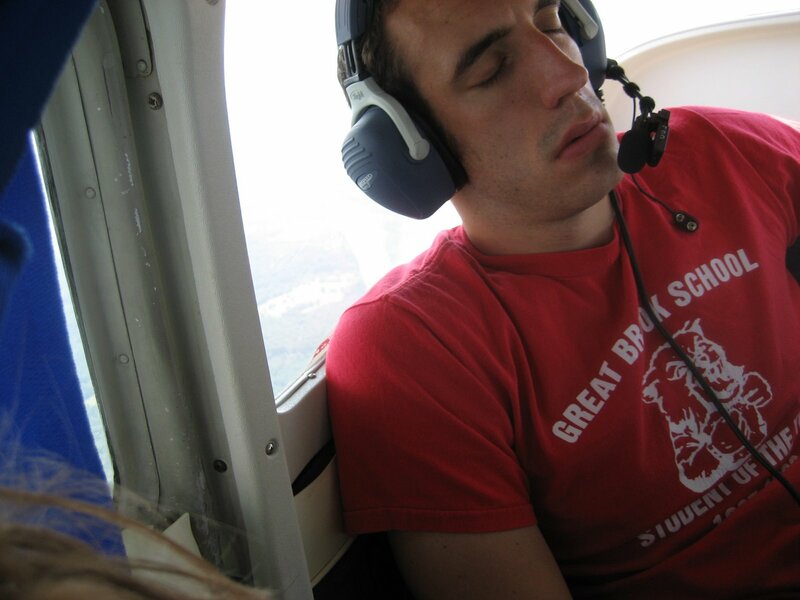 Instead I am reading manuals for the various avionics, etc. And waiting, waiting, waiting for the weather to be good enough so the seller can fly it down. 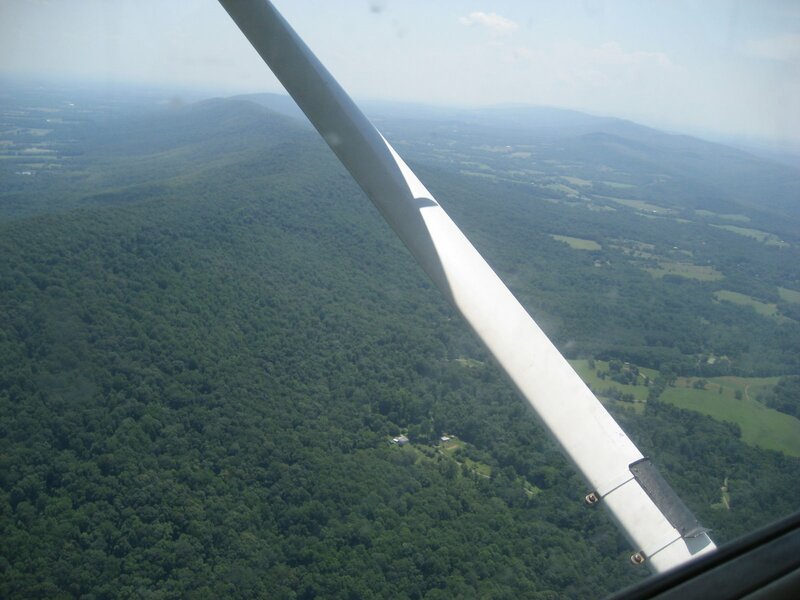 Nate had always wanted to see Virginia, so I picked a route that would take us through parts of Virginia and West Virginia to an airport in Cumberland, Maryland. This is the same place that Jodie and I went on our first flying date. As on that flight, I chose a route to take us over Harper's Ferry, and I took the time to show our route to Nate and Chloe. Chloe, in the back seat for the first part of the flight, documented the occasion. 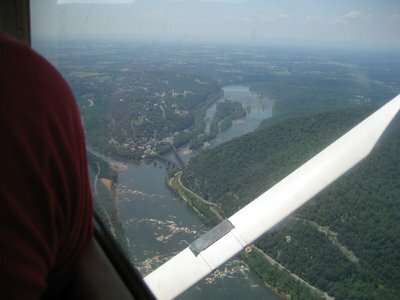 "We're going from this squiggly line over past this squiggly line...."
We headed northwest and were soon approaching Harper's Ferry, one of my favorite landmarks for people flying for the first time. Rafters and kayakers were clearly visible on the river below. It was HOT, above 90 degrees, and I spent some time imagining how nice it would be to be on the water. Can I jump from here? I asked Nate if he wanted to fly. He did. "Who, me? Fly? You betcha!" Keep your eyes outside, Nate. while I enjoyed the scenery. 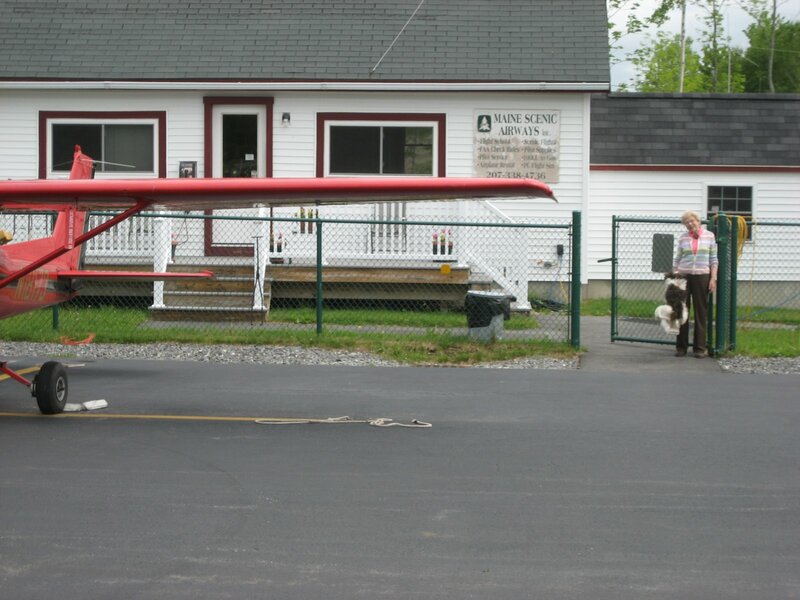 We had a silky-smooth touchdown in Cumberland, parked the plane 20 feet from the restaurant, and strolled in for some sandwiches. It was hot as blazes out on the tarmac, so I had my mind on a tall, cold Coke. We headed back out to the plane, and this time Chloe sat in the copilot's seat while Nate climbed in back. I was having a great time. "Is there anything better than this?" Chloe flew so smoothly that Nate fell asleep, much like Jodie did before. Flight Service had advised that there was a line of thunderstorms south of our path and moving northeast, so we booked it home as fast as Three Five Romeo would take us. 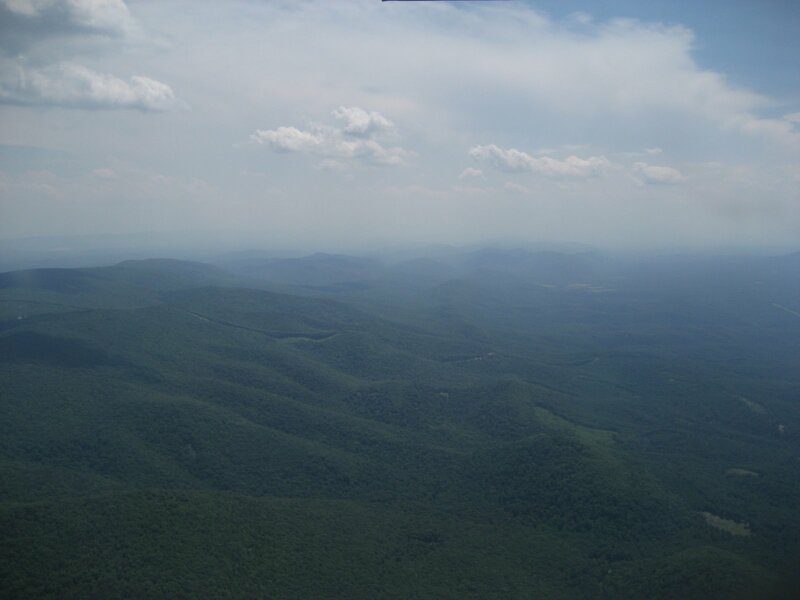 We didn't see anything that looked like a storm near our route, though, just lots of haze and little cumulus puffs under high stratus clouds. One big disadvantage of living in the Washington area is that my family is an eight to ten hour drive to the north, so I don't get to see them nearly as much as I'd like. Work demands usually mean that I have short windows of time to go visit, often for only a weekend. General aviation could eventually make that trip significantly more feasible, but probably not until I have my instrument rating so that I can more reliably plan when to come and go. A case that was keeping me in the office seven days a week settled last week, so I cleared my desk and headed to Massachusetts and Maine to see my parents, brothers, and their families. I met my youngest nephew, Cameron, who was only two weeks old. The oldest of my three nephews, Emerson, and I explored two-wheel methods of transportation, although not without incident. I had fresh seafood and went fishing with my dad in his boat. It was a great time and a much-needed respite from work. And I went flying. 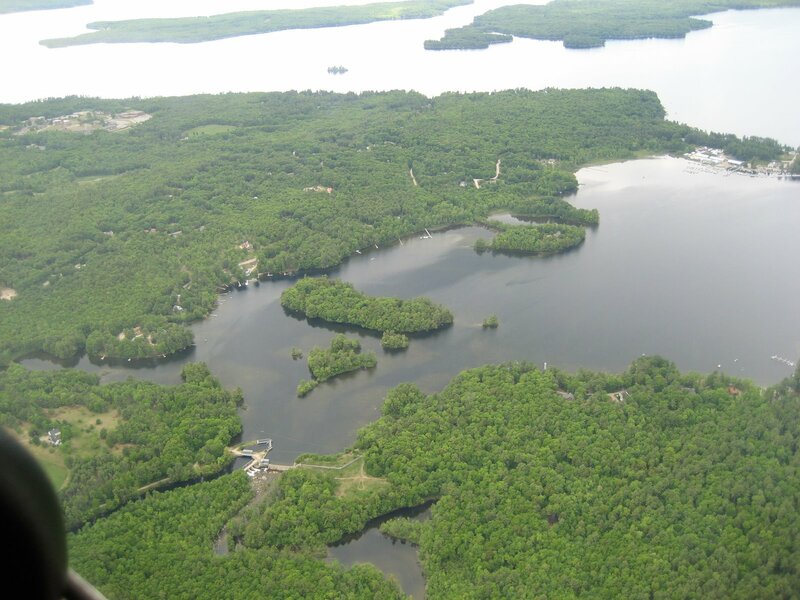 Maine has a beautiful landscape with hundreds of lakes, thousands of inlets along its shore, and hundreds if not thousands of islands off its rocky coast. My flying in Maine has previously been limited to taking my family for sight-seeing hops around my parents' local airport, but I've been looking forward to exploring Maine by air. My parents live about a three-hour drive from my grandmother's house. While relaxing over dinner with my parents, I learned that my grandmother's shower had stopped working. My father can do plumbing in his sleep, so I suggested that we see about flying to my grandmother's house to fix her shower. The weather was beautiful where my parents lived, but overcast with low ceilings further north. The forecast was for conditions to improve, though, so my dad and I headed to the airport in the morning and I rented a 172SP from Southern Maine Aviation. 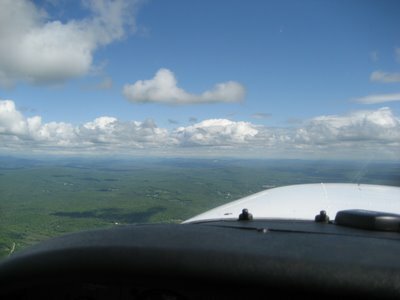 We took off from Sanford (KSFM) into a beautiful blue sky dotted with cumulus puffs. 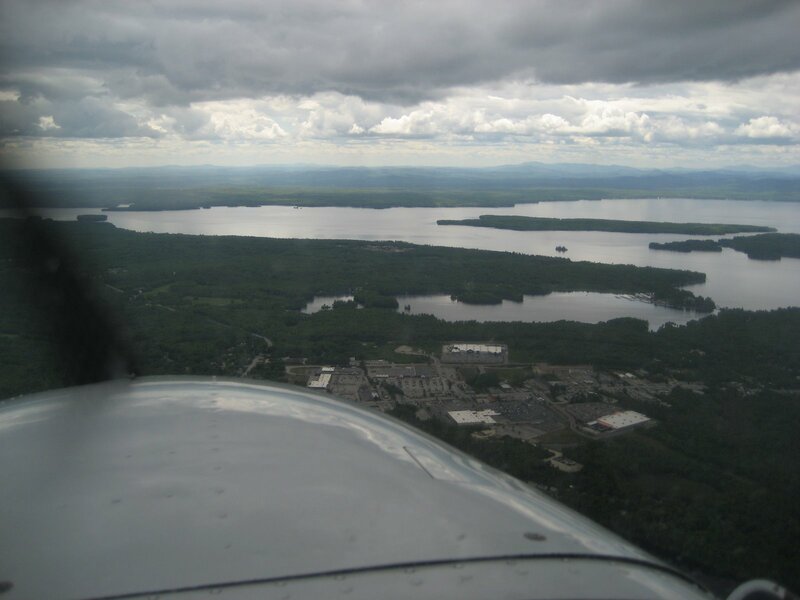 Our course was northeast, directly over the Class C airspace around Portland International Jetport (KPWM). For a northeasterly heading, I needed to be at 5,500 feet to clear the Portland airspace. Since scattered clouds were reported at 4,000 feet, that altitude would also put me above most of the clouds. I headed north to give us time to climb and establish contact with Portland Approach for flight following, circled up between some clouds, then headed on our way. The clouds were higher than reported, so we climbed as we approached Portland. As we passed Portland, the clouds grew even higher and closer together. 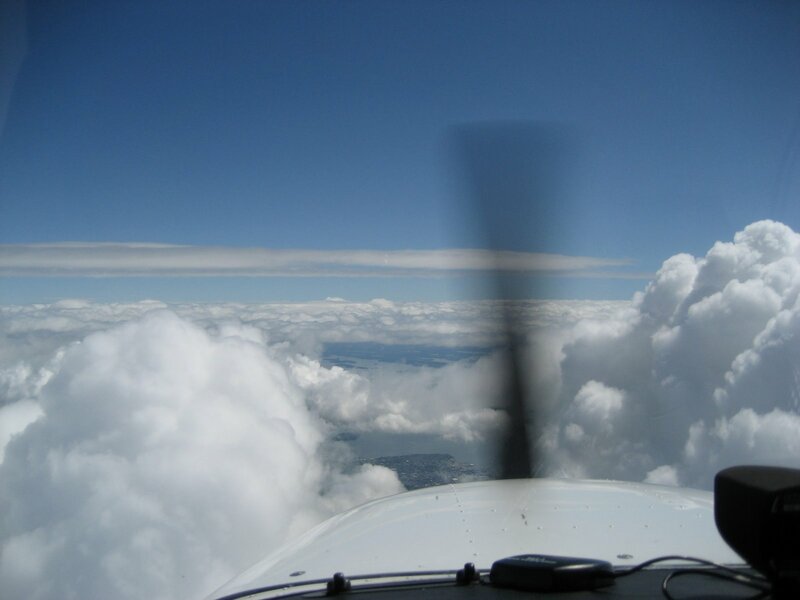 Before long, we were weaving our way around cumulus buildups at 7,500 feet while marveling at the hundreds of islands off the coast that we could see between clouds. It was beautiful. Beautiful or not, I was watching the gaps between clouds grow smaller and fewer as we flew. Passing Brunswick, I decided we should take advantage of one of the few remaining gaps and descend below the cloud layer. We jogged west and dove through a gap in the clouds, then turned northeast to continue on our way. We passed over the Bath Naval Shipyard, then within minutes were looking east toward Rockland where my family likes to spend holidays. Just on the other side of those hills in the picture below is Camden, Maine, where my family congregated last summer for my cousin's wedding. 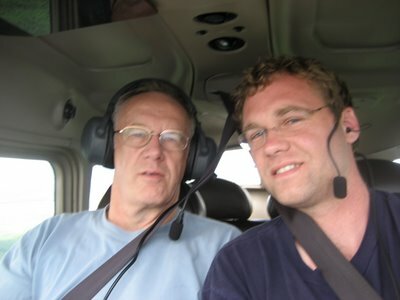 When we were about 10 miles south of Belfast (KBST), I called ahead to announce our arrival. A voice responded, asking how long we would be staying. "We'll be there a couple hours," I said. "Until you fix the plumbing?" the man's voice replied. "Say again?" I was not expecting anyone to ask about the plumbing over the radio, so my brain was having trouble understanding. "Your grandmother is here waiting for you. She says you're coming to fix the plumbing." Indeed we were. We touched down smoothly and I taxied to parking. My grandmother was waiting and her dog, Pepper, ran to meet us. We had a wonderful time with my grandmother. We had lunch, then she and I caught up while my dad did, in fact, fix her plumbing. As she drove us back to the airport, I realized that it was just about three hours since we had lifted off from Sanford. If we had driven, we would be just arriving! 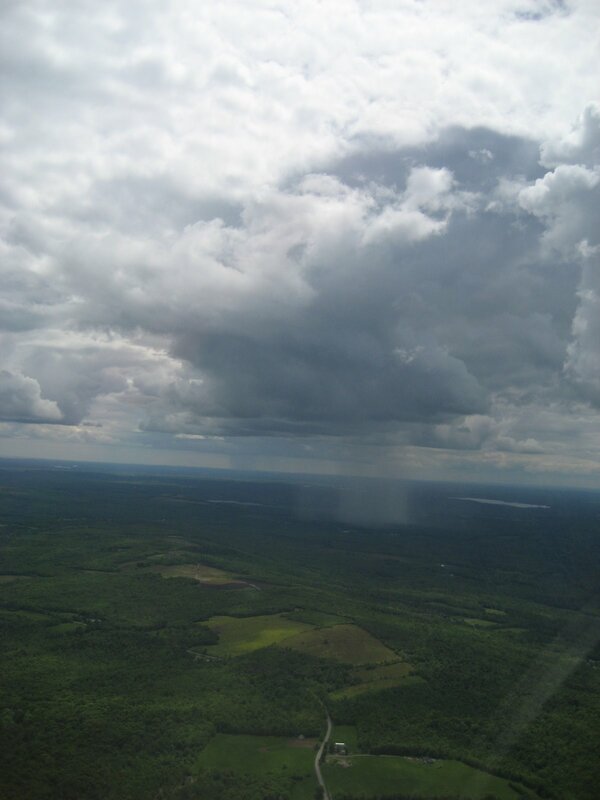 I called flight service for a weather briefing and was advised of relatively low clouds over most of our route, scattered showers, and mildly gusting winds at our destination. 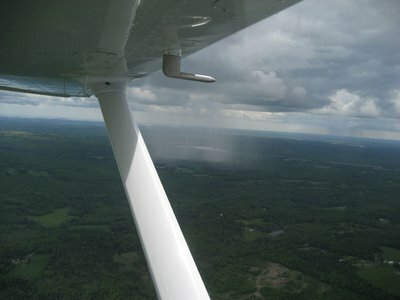 With a cloud ceiling of only 2,000 feet, we flew low and dodged rain showers as we headed south. It was beautiful, and the air was silky smooth. I had never seen rain showers from this perspective, and marveled at them while adjusting our course to avoid them. Soon we approached Sebago Lake, which is Maine's second largest. I looked for three radio towers that were around the lake, one of which reached 1,800 feet above the ground. I also looked for the house of my sister-in-law's parents, which is on Sebago Basin, in this photo below. As we approached Sanford, I listened to the weather report. 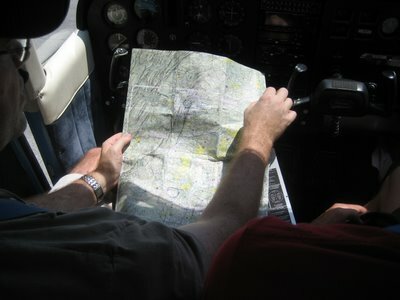 Although our ride in the air was smooth, the winds on the ground were reported as 290 degrees at 8 knots gusting to 15. That's a 30-degree crosswind. 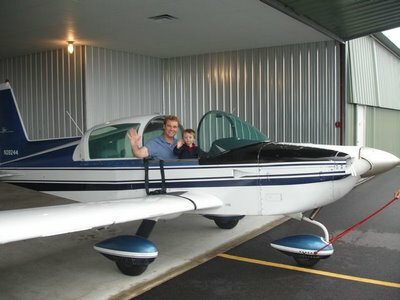 It was nothing very dramatic, but I hadn't flown in a while and wanted to impress my dad with a smooth landing. 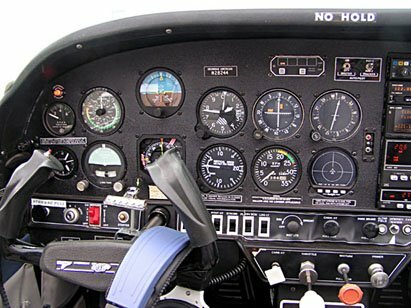 Hitting the "pilot isolate" switch to help me concentrate, I carried a little power and a touch of extra speed into the flare. The touchdown was so smooth, it was almost unnoticeable. 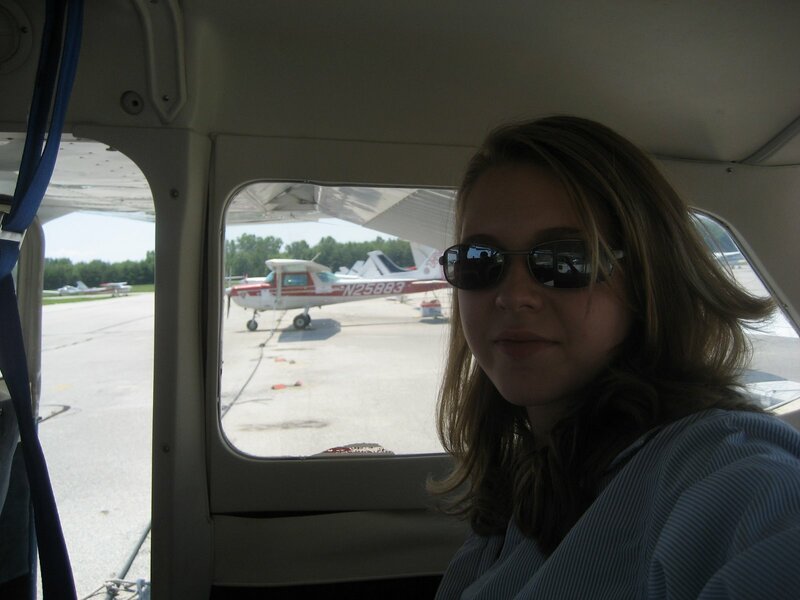 I mentally patted myself on the back as we taxied to return the plane. The whole flight up and back was a great experience, and the fact that we were able to help my grandmother made it even better. 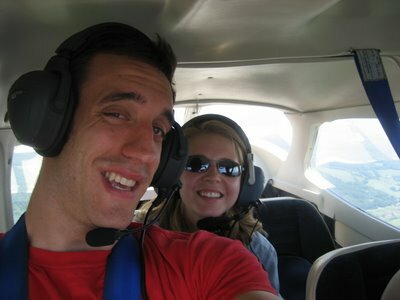 Instead of six hours of driving, we spent under two hours flying and were able to see things that neither of us had ever seen before while creating a great memory. Jodie and I are considering purchasing an airplane. 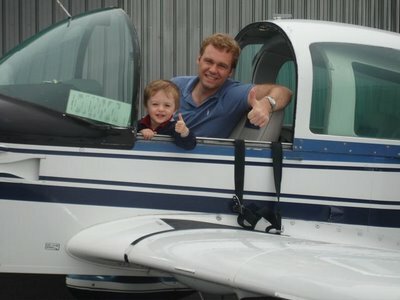 With fuel prices high, many pilots are deciding not to fly, so there is a glut of airplanes on the market, driving prices down. My favorite type is a Grumman Tiger. 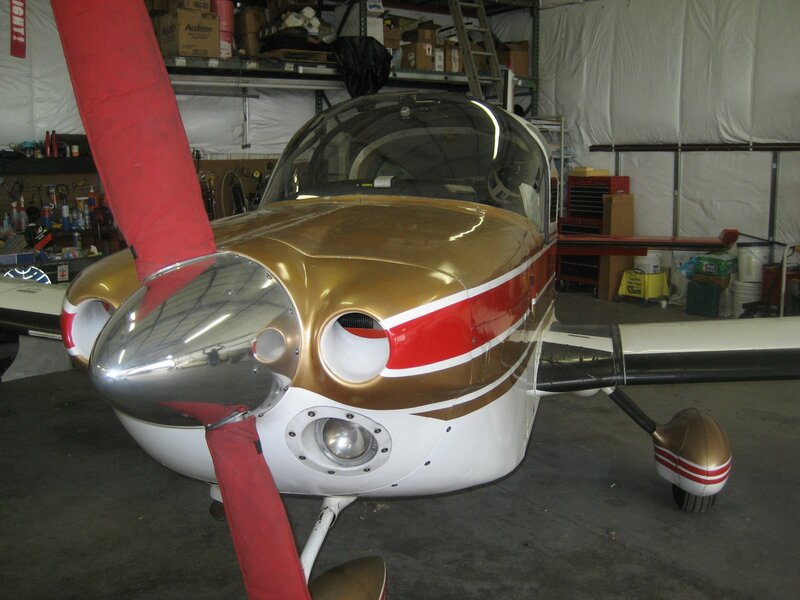 Driving home to Maryland, I deviated east to Republic Airport (KFRG) on Long Island to see a Tiger that is for sale. 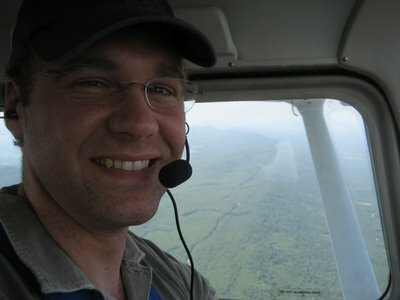 Although I had never flown a Tiger before, I went for two flights in this plane. 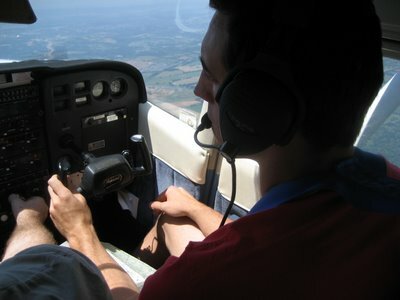 For the first flight, I flew from the left seat from taxi to landing. What a great plane! It carves the sky, with light controls and great speed. Although it has the same horsepower as the 172SP my dad and I used for our trip, the Tiger handled more like a sports car and was about 15 knots faster. This particular plane isn't quite the right Tiger for us to buy, but it was a great experience to fly it in circles over Long Island Sound.